*note* In order to be fair, I won't be judging the love triangle upon my re-read because at the initial time I had read this book (end of 2010-ish? ), I hadn't read 50 gajillion love triangle books already, so there was nothing about this situation that felt like an overdone or recycled plot. Because the series originated in early 2009, I give the books a pass for being on the early/starting end of the love triangle trend. 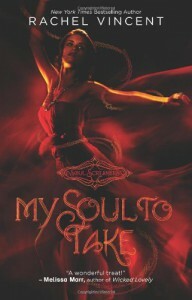 *original review*My Soul to Take was a clever book. Much like my newfound fascination with the book [b:White Cat|6087756|White Cat (Curse Workers, #1)|Holly Black|http://d.gr-assets.com/books/1358274572s/6087756.jpg|6264661] for having a story that I hadn't seen before, this one also had some new tricks to please an old dog like me. I can't recall ever reading a PNR about bean-sidhes (banshees) and their song that ushers in the dead. It didn't hurt either that there's a hot grim-reaper hanging around and getting in the way. I almost feel like I'm being set up for some bad sitcom in which we blame everything going wrong on death's "shenanigans. "Even though I wasn't wowed by the book, I will say that since I'm an avid fan of Vincent (love her adult Shifters series), I trust that she'll be taking me to a good place with these books.